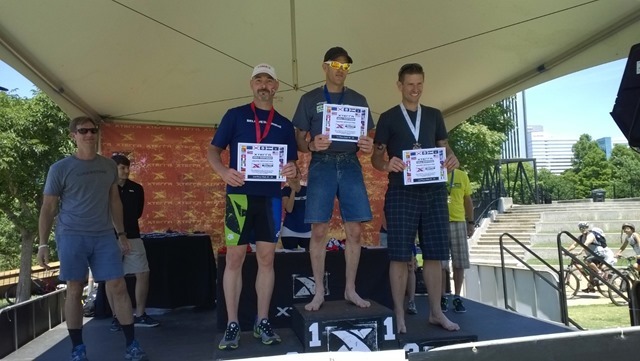 The race in Richmond, Virginia this year was not only the XTERRA East Championship but it was also the 2014 USAT Off-road National Championship. This doubling up of championships doubled up the competition with new names and familiar ones. 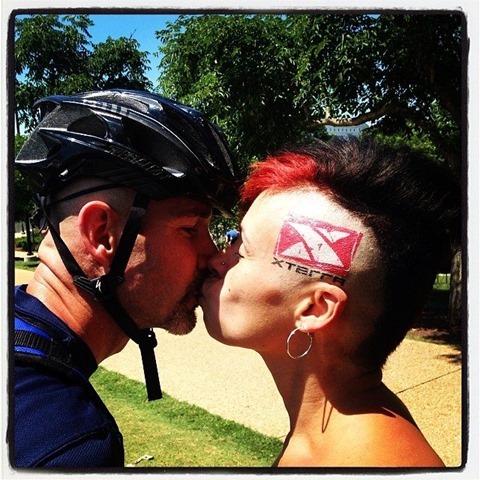 Since it was a sort of special race, Alba even went so far as to shave the side of her noggin to clear a path for one of the XTERRA temporary tattoos along with a splash of red color. When tackling this great race, you always have to be prepared for change. 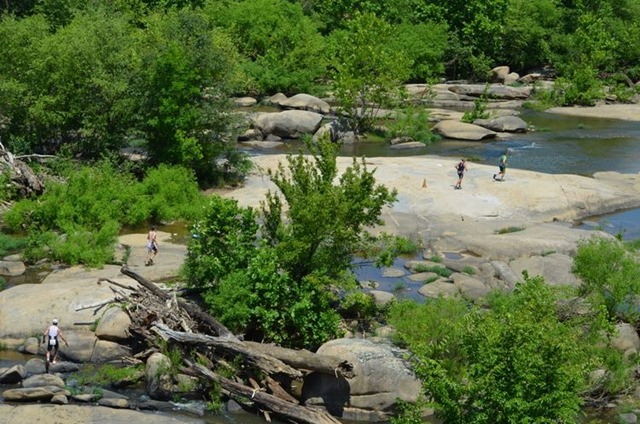 Weather this time of year can have vast effects on the trails and since it is a river swim, it can cause the swim to be either a “running swim” or it can make it a treacherous one with strong currents. 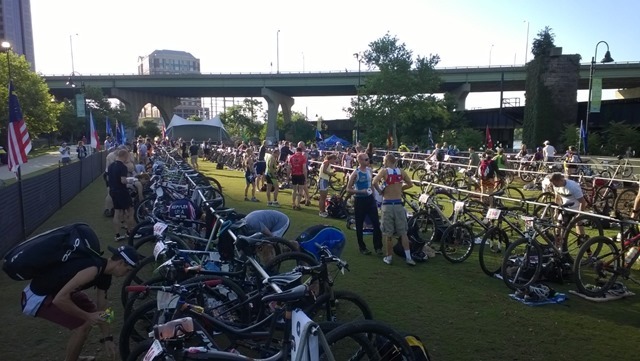 Last year, the race was changed to a duathlon since the area had so much rain, you’d have a hard time boating the river, much less swimming it. I transitioned quickly to the bike and headed out (T1: 00:50) The bike course is a two-lapper and with the pros starting their race about 45 minutes ahead of us, I happened to catch up with Shonny Vanlandingham just as she was beginning her second lap. Darren Cox was also with us and the three of us would play tag for the bulk of our first lap. There was a TON of traffic to deal with from the previous wave of racers, but we all were polite as the three of us passed as many folks as we could. We were chatting back and forth and Shonny was encouraging folks in front of her. Very cool. 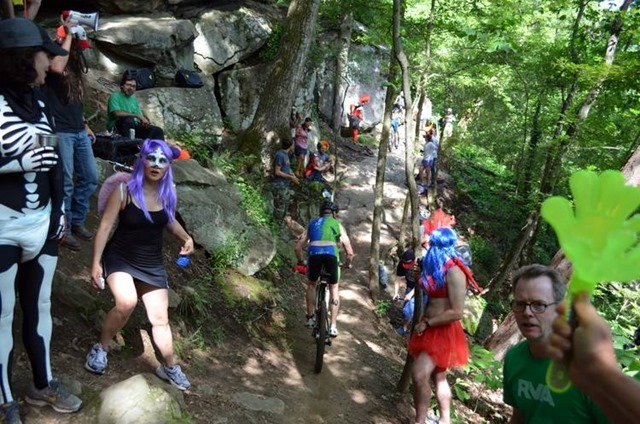 The locals showed up once again at the slick rock section, whooping and hollerin’, drinking, playing loud music and even cooking meat on a grill. I’m not quite sure how they got the grill down there, but I am certain they weren’t hungry. As we came up to the Stairway to Heaven, a section that allows you to ascend from the canal level up to a neighborhood, I was still on Shonny’s tail. We went up the zig zag ramp, into the switchback rock garden and into the neighborhood. On the way up, Darren had to step off causing us to pass him. At the top, there was a feed zone complete with bottle swaps where I grabbed a bottle. In the process of doing so, I lost track of Shonny for a second, but picked her up ahead. I jumped up front, Darren right behind and Shonny on his rear. We had a pretty fun little peloton through the neighborhood as we dove back into singletrack. We caught up with more traffic and it wasn’t long before I lost track of both of them. After another decent transition (T2: 00:51), I headed out on the run which consisted of about 3 miles of flat, non-technical followed by about 3 miles of technical and single track. I caught a couple of runners early on but continually saw a pack of three runners which looked out of reach. This sight continued until we dove into single track where it appeared that I was closing the gap. Sure enough, once we hit the dryway, a section of the James River that we run across during normal water height, I passed the 3 runners. I scooted across the dryway as quickly as I could, catching a glimpse of the elusive Trey Garmin who tends to pop up on various parts of XTERRA courses with his third eye, a camera that gets some great shots of racers in action Getting onto Belle Isle, I passed a couple of sprint racers throwing out some encouragement on the way. Once I made it back to the road, I could see Jim Fisher up ahead, but just a bit out of reach. I picked up the pace a little just in case someone was coming up from behind and crossed the tape at 2:45:58, for a run time of 43:36. That put me second in the division and 10th overall amateur. I was a little disappointed that Darryl “Speedy Gonzalez” Weaver took the top spot, but was very pleased that I had a clean, fast race that was a ton of fun. I know a lot of you hear me on Facebook and here in my blog talk a lot about my XTERRA family. Some of you understand, while others think it’s kind of kooky and weird. Others, once they experience it, finally understand. I’ve done all sorts of racing such as road triathlons, road biking, road running, trail running, obstacle course racing and many others. 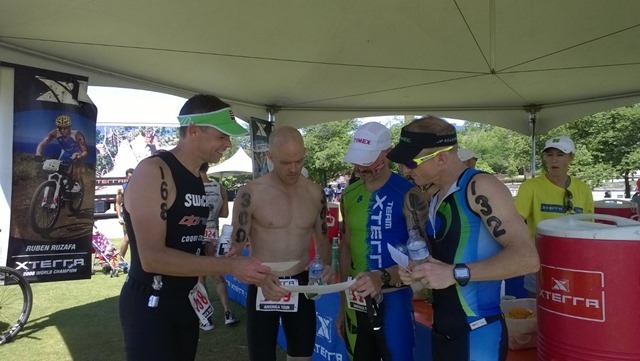 No matter what other things I’ve tried, nothing compares to the camaraderie of XTERRA. My personal example is prior to the race, I was having all sorts of shifting issues. Ghost shifting, dropped chains, you name it. 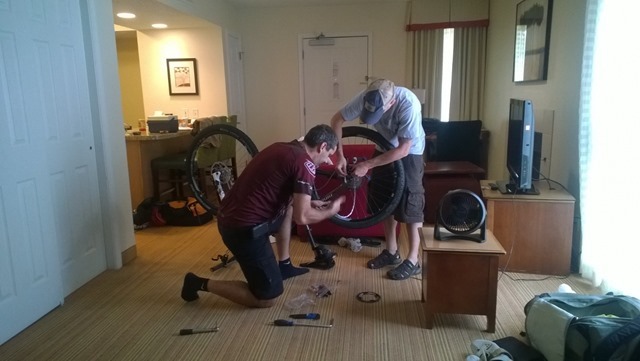 I was fortunate enough to be in the same hotel as Pax Tolosi, mechanic extraordinaire and all around Sherpa for Beta Wronska. 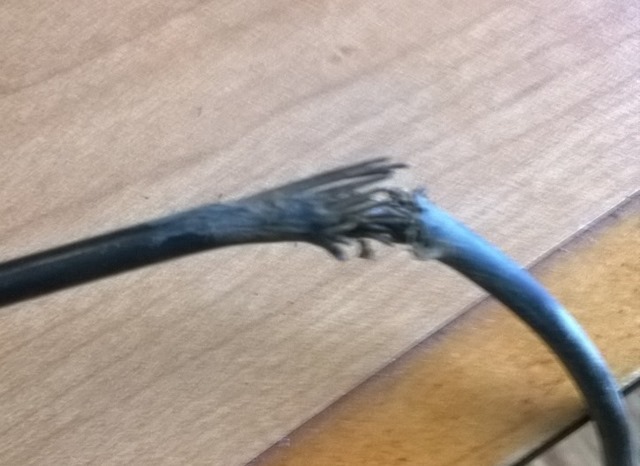 We were all going on a preride of the course and I discovered a slight problem. Pax dropped what he was doing and came over to give me a hand. We completely recabled my bike (internal routing), changed a chain ring and put on a new rear derailleur, all within MINUTES. Throughout the race, my bike shifted flawlessly except for one dropped chain which was caused by a stick getting wedged in there. I wholeheartedly agree. 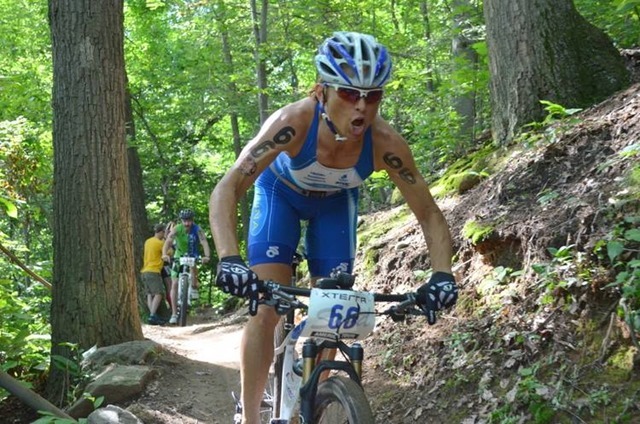 This is but only one of many, many stories at any XTERRA race. I challenge you to find it at any other race. 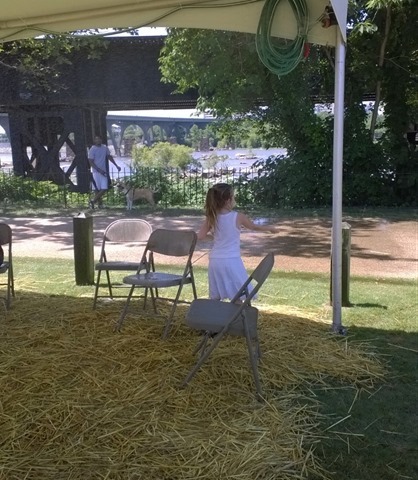 Even the kids love the misting tent. Products used: GU Roctane and GU Brew, Schwalbe Rocket Ron Tire, Schwalbe Thunderburt Tire, Cobb DRT SHC Saddle, Synergy Adrenaline Wetsuit, ESI Grips, Crank Brothers Candy 11 Pedals, First Endurance Multi-V.
Come join me THIS Sunday for a preview of the XTERRA Whitewater course and a transition clinic. Here’s the details.